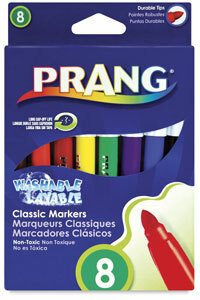 Prang Art Markers offer rich, bold colors that won’t bleed through paper! The super sturdy bullet tip creates broad or fine lines, and the ink won’t dry out, even if the cap is left off for more than 24 hours. Ink washes easily off skin and most fabrics. Ventilated cap ensures safety. Washable Markers Master Pack — 25 each of 8 popular colors that blend well, keeping the classroom buzzing with creativity. Colors include Red, Green, Orange, Yellow, Purple, Blue, Black, and Brown. Washable Set of 8 — Red, Orange, Yellow, Green, Brown, Purple, Black, and Blue.